If you live in a mixed environment of Windows 7 and 8/10 computers, you might want to set the usernames to be the same so you can share the files/printers without managing Homegroup. I searched the web for quite a while, came across stuff like UPN (User Principal Name) without luck (No active directory on Windows 7, nor I want to setup a domain controller in Windows 2008 for home network). 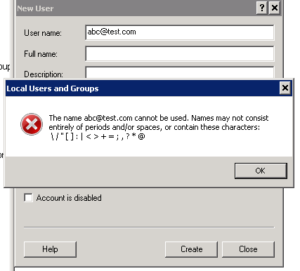 Turns out the solution is dead simple: use the “User Account” from Control panel to create the user account. No questions asked!